Ann Tyler: "In my earlier works, I mined the public arena for much of the collaged material of my books. The stories revealed were always within the commonwealth but needed a particular assemblage to become visible. My current work, while still culling from our known world, requires a greater degree of movement away from the "original." The created becomes the "real" while the "original" is transformed into metaphor. 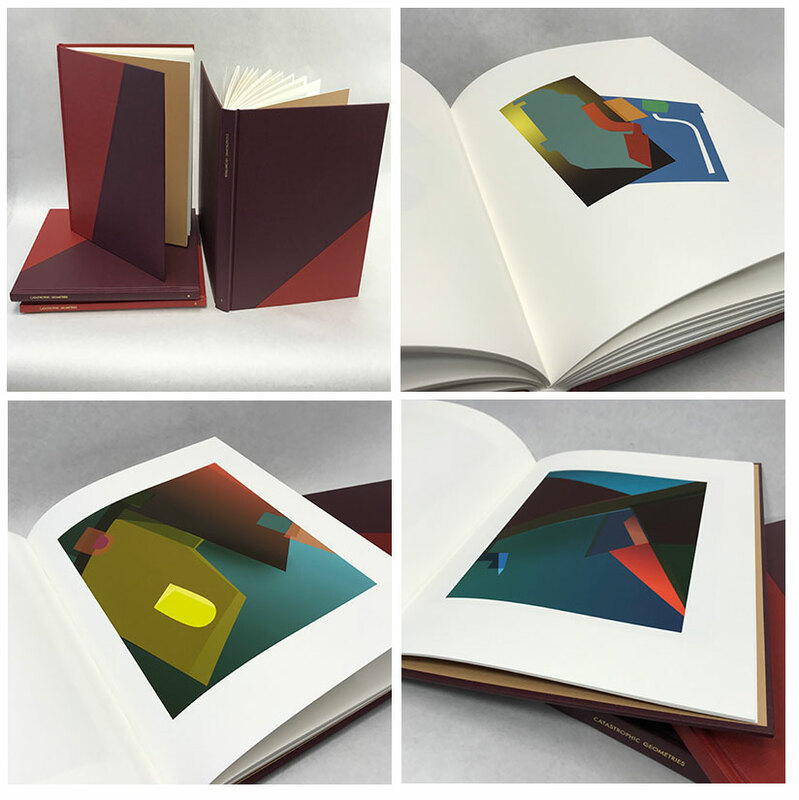 "The methods of structuring my books, the use of narrative to create an emotional and intellectual experience for the viewer, the techniques of image creation and writing, and the material use and references all parallel my design profession and role as an educator." Urbana, Illinois: Ann Tyler, 2019. Edition of 5. 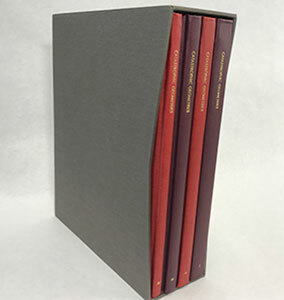 Four volume set in Slipcase. Books: each are casebound in linen bookcloth, hand-sewn, with gold foil-stamped title and volume number on spines. Each book 9.375"w x 12.125"h. Volume I: 90 pages; Volume II: 52; Volume III: 48; Volume IV: 32. Paper: MOAB Entrada Rag Natural 190gsm. End sheets: Fabriano Tiziano. Inkjet printing, graphite notations (Vol IV). Custom Slipcase: 9.5"deep x 12.5"h x 3.5"w, covered in bookcloth. 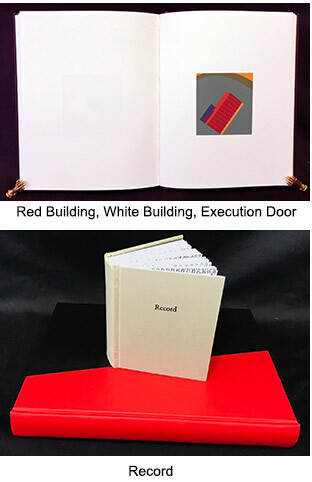 Continuing her work on Syria (see Red Building, White Building, Execution Door, 2017/2018), Tyler's four-volume set explores the intricacies of capturing through visual means (say images from a satellite 500 miles above the earth) a situation that is removed not only in time and distance but also in terms of a cultural sense of acceptability and possibility. Abstract images extrapolated and manipulated examine atrocities (a cultural label or simple truth?) in elegant color forms abstracted from photographs smuggled out of Syria or from satellite images. Matters of perspective, experience, and expectation are everywhere involved. Volume I of the series begins with an epigraph (from the Center of Justice and Accountability) that looms over the entire production: "It is impossible to interrogate, torture, and kill tens of thousands of detainees without a system in place." "The 'Geometries' of the title is telling. It points to the power and limits of modern-technology that can translate human experience into a numerical version. This allows us to see beyond the limits of our own eyes, but much is loss in the translation. We can see colors and shapes but may miss the humanity of corpses lying on a concrete floor." Chicago, Illinois: Ann Tyler, 2017. Edition of 20. 9 x 13"; 9 leaves. Inkjet printing on Hahnemühle Museum Etching with deckled edges 350 gsm paper. Laid in paper case (10.24 x 13.25") of Murillo by Fabriano 360 gsm. Slip and tab closure. Signed by the artist. Ann Tyler: "Seven views of nebula in the 'night sky.' Nebulae are comprised of gas and particles formed when portions of interstellar media undergo a gravitational collapse. In Nebulae the beauty of the destructive and formative aspects of the universe is posed against a 'gravitational collapse' on earth during warfare. Bombing reduces the solid matter of human lives to particles. "The nebula images were created by observing many NASA images and then selecting particular newspaper source images of skies recorded during bombings. The actual source of the base image is revealed at the end of the series — Gaza, Syria, Ukraine, Yemen. "The Rilke quote builds through each sequence to form both its original meaning and additional interpretations in juxtaposition with the images. 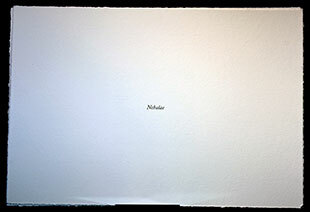 The images when seen only as nebula serve as an augmentation of the poem's intended meanings. when one realizes the source of the images the poetry fragment assumes additional meanings. For example, the pages containing only 'not to forget' and 'you' - in the Rilke poem one can read 'you' as the wonderful world making life worth living. When connected to the bombing, 'Not to forget / you' becomes a chilling statement directed toward the perpetrators of the bombings." Chicago, Illinois: Ann Tyler, 2017. Edition of 10. 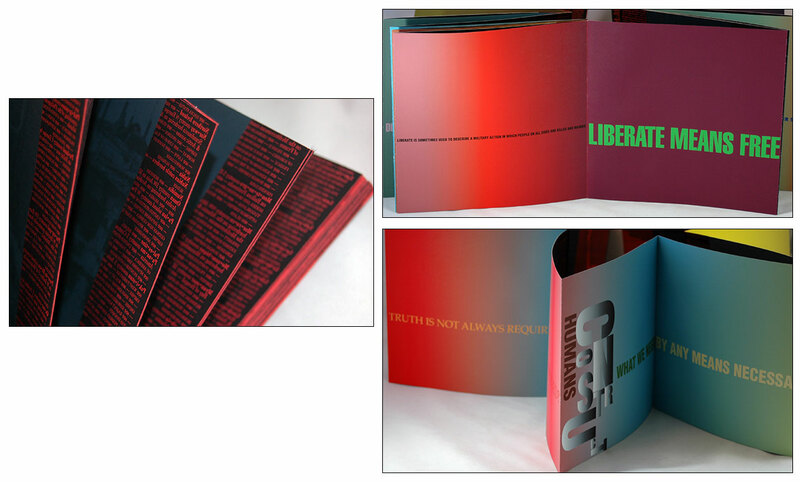 8.25 x 8"; 44 pages including covers. Double-sided accordion fold. Papers: 50# cover, Premium Matte, Bright White; 20# Mohawk Brite Hue. Ink jet and laser jet printing. Laid in 8.375 x 8.125" paper case of Murillo paper by Fabriano 360 gsm. Signed by the artist. 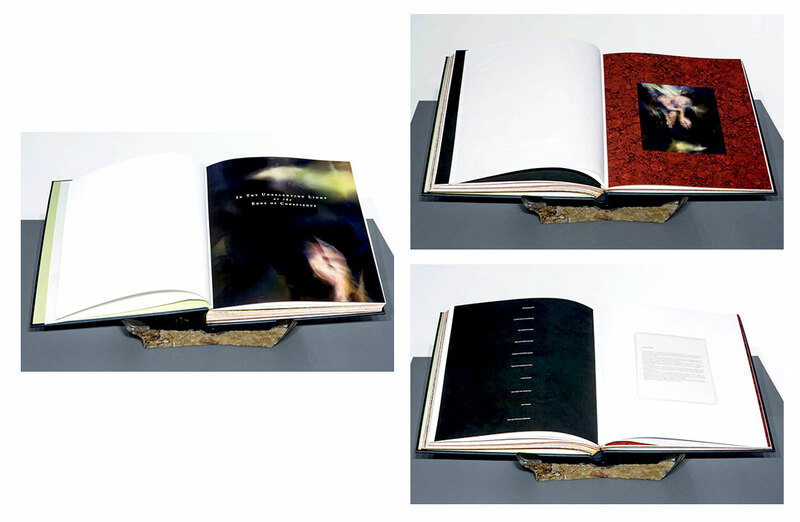 Ann Tyler: "Using language and image to examine a world of war and shifting borders, the book is an accordion fold structure with language as landscape on one side and images of bombed homes on the other. The binding strips show at the joinings on the language side as thin strips of red - referencing flashes of explosion. The voice loops back on itself moving among rationalization, definition, question, pain, anger, question. "The rubble images are from the newspaper and I've retained the halftone to create a coarse image and then pulled the image back by using the overlay of blue. Periodically I've introduced color into the rubble image to refer back to the moment of the bombings. The colors are also drawn from the language side of the book - making a physical connection between the world described and the actual world. "The binding strips list every country in the current globe and after each country are the names of that area of land going back in time. These lists also have a mirror image running backwards through the book. I did this to point to a non-stop looping around the globe. There are also sections of land and ocean among the binding strips - these curve outward on each end and become more straight toward the center - another reference to the globe. "The paper case clasp also references the globe and repeats the red of the binding strips." Chicago, Illinois: Ann Tyler, 2013. Edition of 3. 14" x 18" closed, 28" x 18h open; 124 pages. Hahnemühle Photo Rag Duo (acid-free, archival) with Hahnemühle protective spray. Ink-jet printing. Edges handpainted in acrylic gold and burnt sienna. 100% cotton vellum sheets with white foil stamping. 14 image plates of species. Bound in Gutenberg archival calfskin leather, blind stamped. Fabriano Tiziano end papers. Signed and numbered. Ann Tyler: "The graphic novel In the Unrelenting Light at the Edge of Conscience is a science fiction tale in which the violent actions of governments in our world have created new life forms in a world somewhere in deep space. The new species and their relationship to violence are discovered through space / time laboratory investigations carried out by an 'experimenter.' The narrative is structured for the viewer to also undergo a process of discovery as he/she moves through a narrative combining stream of conscious rumination, traditional description, imagery, poetry, and scientific information. The narrative and imagery move between the possible and the impossible, from the outer world to the inner world. After establishing this causal relationship between the two worlds – human actions and new life forms in the universe – the narrative then shifts and begins to allude to the possibility that this other world may not be an exterior universe but may instead be the universe of the mind. This other world is possibly a result of larger human actions upon individual memory. "Edge of Conscience refers to what lies just out of reach in our memory. While unseen it still plagues us. Conscience contains the multiple meanings of the conscious mind and morality. Unrelenting Light refers to parts of our memory that are difficult to examine and when once illuminated are understood to be a relentless part of individual experience. "…From a metafictional perspective the author is the 'experimenter.' 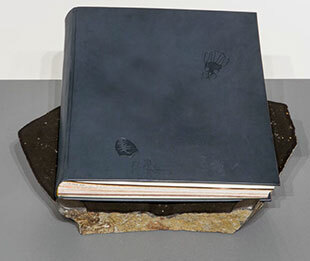 The artist book itself is an experiment – an attempt to understand the impact of history on the individual and society and how we absorb the history we live through." "The coding of the species (the white foil stamping) is an invented scientific notation - the first numbers are longitude and latitude translated totally into minutes - thus reinforcing the idea of geographic time. It is the longitude and latitude where the original photograph is taken. The second coding number is actually the date the photograph was taken. "I have made up the 'Latin' species names. They combine existing species words and 'Latinized' words relating to the image and the original photo. ..
"The section describing the originals also has the longitude and latitude coding which would allow the viewer to refer back with some of the images and know from what original circumstance it was derived. I intentionally do not show any of the originals in the book nor do I describe every original as I believed that would destroy the surreal reality I have constructed by revealing too much." Chicago, Illinois: Ann Tyler, 2013. Edition of 40. This is the trade edition of the original edition of 3. See description above. Ann Tyler: The capacity for benevolence and malevolence – within single individuals and within communities as a whole, traversing from one moment to the next and sometimes from one extreme to the other – defines the human, socialized mammal. My work, both artist books and prints, delves into our human violent histories as well as our present and future capacities. The current body of work derives from the history of lynching in the United States. Chicago, Illinois: Ann Tyler, 2007. Edition of 50. 11 x 15.25"; 22 leaves. 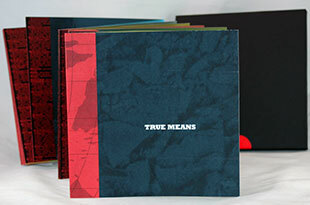 Set in Caslon and letterpress printed in red ink on Cranes Lettra acid-free paper. Clothbound. Images of tools hand-sewn at top to page so that it can be lifted to reveal the text. Source material documented at colophon. One of Tyler's three books about lynching, each with a uniquely indirect approach to the subject . Billy Rabbit is a recasting of an English children's story. In her "American adaptation," Tyler offers a tale of doomed innocence, helpless in the face of mob mentality. 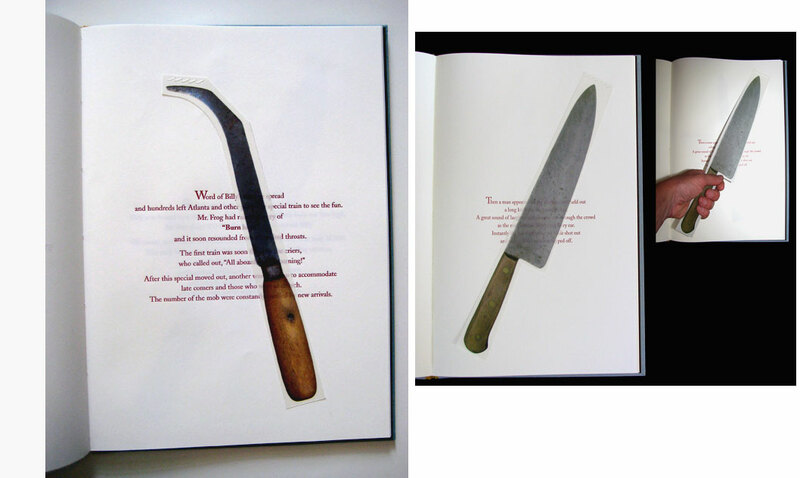 On some pages, the text is covered by images of old, well-used tools — saws, a hammer, knives of various sorts. The reader must lift the image and become symbolically complicit in the story. Ann Tyler: "... constructed from public sources – images and text that exist in the public sphere. The narratives I create with these elements tell a new story while elucidating an old one. In writing the narrative for Billy Rabbit, I fused and rewrote elements from a cautionary, children’s tale and original newspaper accounts of lynchings. (Lynchings functioned on multiple levels including as cautionary tales 'written' to the black community.) The narrative is written to follow the actual narrative arc and ritualized structure of many lynchings." The colophon documents the seven lynchings used as the basis for the text: "Because of the ritualized aspects of lynching, the same acts of torture described here were perpetrated on many lynching victims. These descriptions should, therefore, not be seen as limited to the individuals listed." 8.25 x 7.75"; 32 pages. Set in Snell Roundhand and Caslon. Letterpress printed on Cranes Lettra acid-free paper. Bound in pink cloth with black accents. 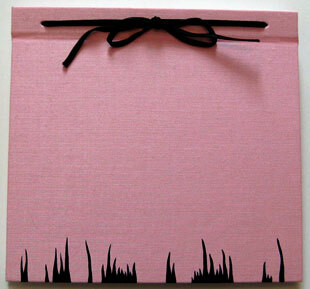 Three hole stab binding with black ribbon lacing. Images tipped in with scrapbook picture corners. Bibliography included for source material. One of Tyler's three books about lynching, each with a uniquely indirect approach to the subject. Souvenirs appears to be a scrapbook from an earlier time. 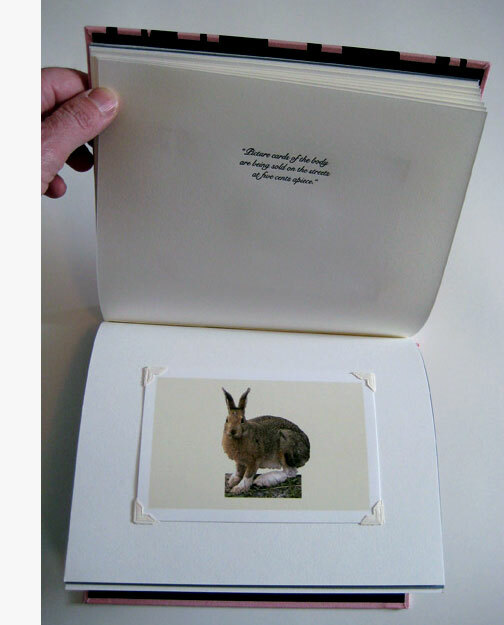 Each spread pairs a photograph of a rabbit, innocent, almost cuddly, with text that is far from innocent: "As the fire died down relic hunters started their hunt for souvenirs. Parts of the skull and body were carried away." A bibliography reveals that the words come from newspaper reports of lynchings. The juxtaposition, presented without comment, is shocking and revealing. Ann Tyler, colophon: "My enduring appreciation of Constance White. Together we have researched the history of lynching in the United States and engaged in critical analysis of the effects of torture on language, the body, and the body politic. The art we each have created would not be what it is had we not proceeded together." Red Building, White Building, Execution Door: 9 x 11.75"; 60 leaves printed on one side only. Laserjet printed on MOAB Entrada Natural Rag paper. Set in Futura. Casebound in red and black boards with yellow free endpages and pastedowns of Canson Mi-Tientes paper. Handsewn binding. Signed and numbered by the artist. Record: 4.25 x 5.25"; 526 pages. Hand-stamped original was laser copied on 20# white laser paper. 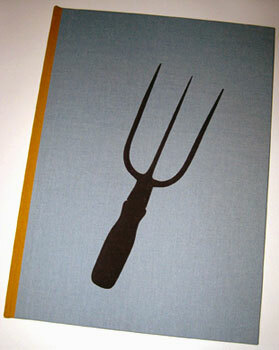 Casebound with title foil stamped on front board. 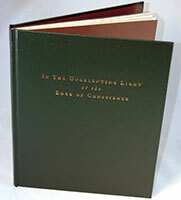 Machine-sewn binding with end sheets of brown Canson Mi-Tientes paper. Signed and numbered by the artist. Ann Tyler: "Both books are based on Amnesty International reports on Saydnaya prison in Damascus, Syria. These reports were subsequently published in major newspapers along with maps and satellite imagery of the prison complex. The methods used in the two books also stand in sharp contrast to each other. 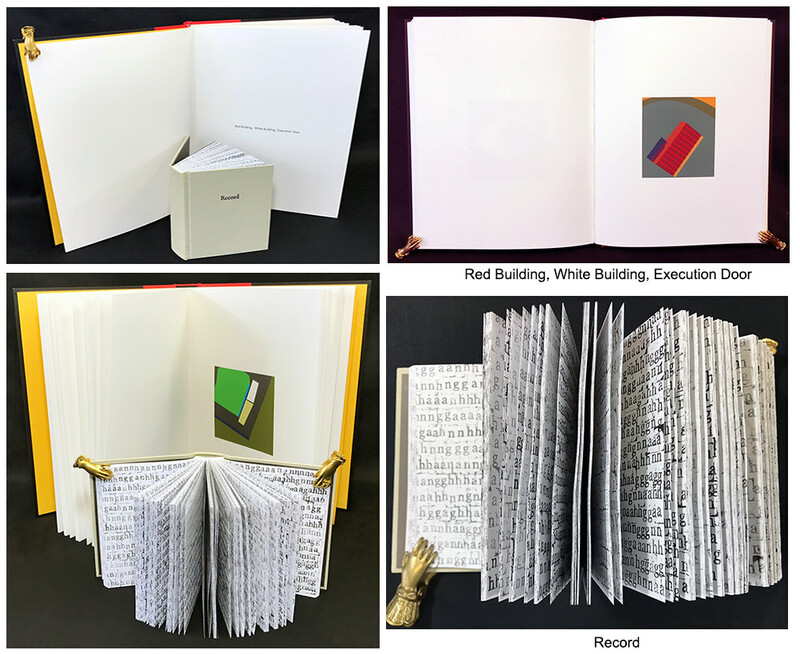 Record evokes the raw interior that Red Building, White Building, Execution Door cannot access. I conceived the books together, and feel that they work best as a pair; each enhances and augments the other." Red Building, White Building, Execution Door focuses on the exterior of the prison; Record represents what was going on in the interior. Red Building, White Building, Execution Door and Record, Afterword, from reports by Amnesty International: "Civilian detainees were held in a 'red building' and hangings were carried out in a 'white building.' The bodies from Saydnaya prison were dumped in two mass graves on the outskirts of Damascus between midnight and dawn most Tuesday mornings for at least five years. "Satellite imagery reveals that a crematorium has since been constructed within the prison complex." Ann Tyler: "The images in Red Building, White Building, Execution Door are all derived from the published satellite images of the prison complex - telling us everything and telling us nothing. Looking, looking, looking as an attempt to comprehend. The book has two sections. In the second section the images have an impression of partial transparency as if looking through, looking closer and yet still not revealing. The formal beauty of the images functions in multiple ways. Beauty heightens a sense of horror when combined with what occurred at the site. The beauty of abstraction also creates a distance as the distance of satellite images or the distance of the viewer from the events. And beauty also speaks of the value of life and so contrasts to the events." "Record is a record of the individuals murdered by hanging at the prison, a record of the ongoing time over which the hangings were documented, and record as a sound recording. The method of hand-stamping the letters was an action to personally represent the 13,000 individual citizens murdered. In an attempt to capture the sheer volume of the atrocity, 260 laser-copied sheets represent the weeks over five years in which the murders have been documented." Chicago, Illinois: Ann Tyler, 2007. Edition of 12. 16.25 x 11.75"; 44 leaves. Set in Aldus. Letterpress printed on Mohawk Superfine. Images created by riddling paper with a punch one-half inch in diameter. 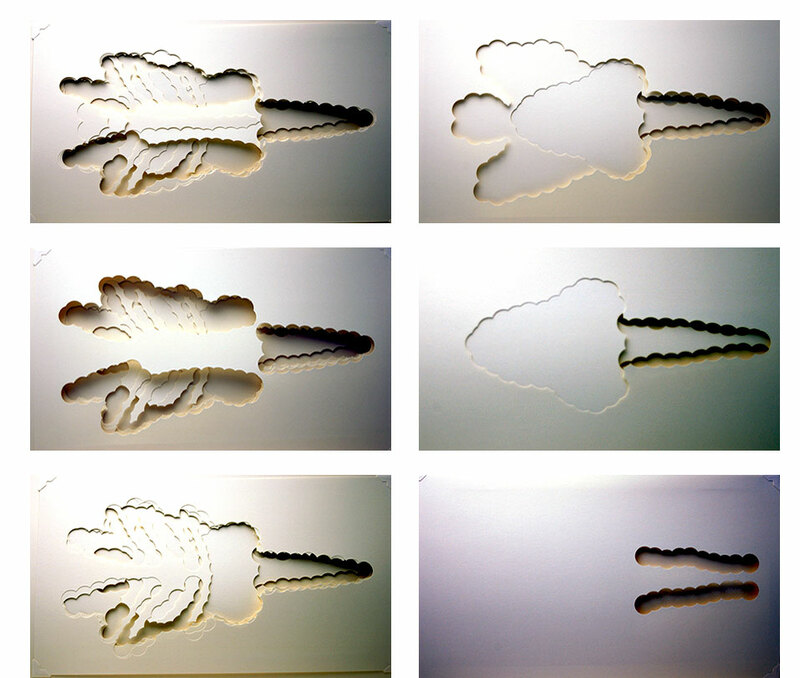 The images — the negative space of the riddled leaf, which Tyler calls "specimens" — are then layered with other images (riddled leaves) to form a set. Within each set a changing series of images is created when the page is turned. For example, the first set has 7 separate leaves. You first see the image created looking through all 7 leaves. Turn top page and you are looking through the remaining 6, then the remaining 5, etc. There are six sets of images in all, comprised of a varying number of individual leafs (7, 3, 5, 7, 5, and 5). Each image section separated with full blank page and tissue guard page. Quarter bound in brown cloth with marbled paper over boards. Paper title label on front cover. In this haunting book, which contains only two snippets of text, the connection to lynching is not revealed until the next to last page: "To 'riddle' is to pierce with holes suggesting those of a sieve, to pierce a body repeatedly with bullets. Victims were often subjected to riddling during the course of a lynching." Ann Tyler: "The Unmaking and the Making of the World has a more metaphorical relationship to lynching as well as a broader reference to human behavior in general. The specimens are abstracted life forms derived from my prints. (The prints are fabulist natural creatures constructed from a base documentary image taken at a lynching.) Made with a ½" punch, the construction of these specimens relate to the act of 'riddling' or shooting a victim so many times that the body was riddled. A dictionary definition of riddling appears in the epilogue. "I developed the forms in the book as I wondered 'what does such a violent action do/take away from one’s soul?' As a perpetrator shoots a victim, 'how are they destroying themselves?' The forms are both perpetrator and victim, but at the same time they are neither. They represent complex aspects of life, death, destruction, and creation. 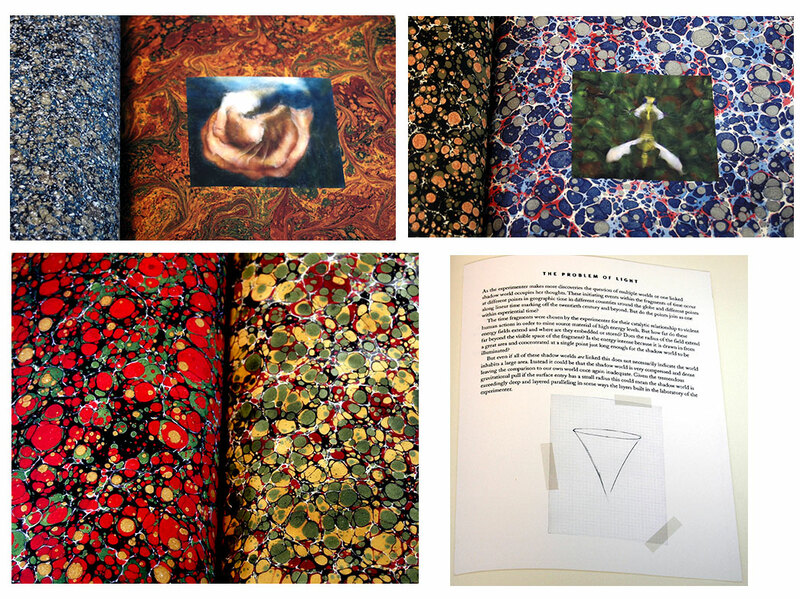 "I wrote the text at the beginning of the book as a metaphorical, pseudo-scientific introduction. Some invisible weight is created as we destroy another being. I imagine the weight increasing with each act of violence, each shot, each hole punched. These acts can be brief in the span of time but they impact the universe which is one aspect of the reference to anti-matter. Anti-matter is very heavy and invisible becoming a metaphor for the soul. I also describe these multiple aspects of human behavior and desire as shadow worlds so anti-matter invokes this idea as well. 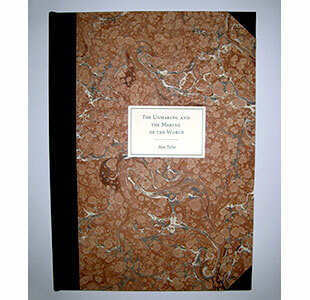 "The specimens are situated in the terrible and yet they are so beautiful. The beauty represents a number of ideas: desire, what endures and cannot be destroyed, what is worthwhile, the best in us and the worst in us."